A popular Verizon summer program designed to encourage minority males in middle school to pursue studies in STEM disciplines operated this summer at four minority-serving institutions. The Verizon Innovative Learning program set up shop at two historically Black universities—Tennessee State University and Dillard University—and two Hispanic Serving Institutions—Florida International University and California State University, Los Angeles. “We’re really looking forward to seeing the kind of impact this program can have and we’re really excited to be part of the process,” said Dr. Tamara Rogers, an associate professor of computer science at Tennessee State University. Minority males in middle schools near these four college campuses were recruited to participate in the program. 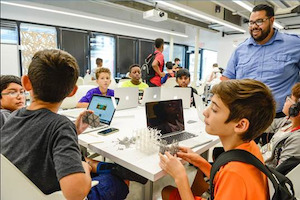 Throughout the summer, the young men had the opportunity to expand their knowledge of the varying science, technology, engineering, and math fields by engaging in mobile app development, 3D design, and building flying drones. Verizon Innovative Learning began in 2015 and includes a partnership with multiple HBCUs and HSIs in an ongoing effort to increase diversity and in the STEM field. Verizon has committed $160 million to the program to provide students with the opportunity of “free technology, access and hands on immersive learning experiences,” in preparation for the digital economy, according to Verizon officials. Verizon officials said that the program has fulfilled its mission. “Over the last two years, we have seen firsthand the positive impact that exposing new technologies and providing ongoing mentorship has had on the minority males in this program,” said Justina Nixon-Saintil, director of education for the Verizon Foundation. At California State University, Los Angeles, students created a fidget spinner app and made it spin through coding. “Just the tangible experience of being able to code, and having it be relevant to their world today and popular culture was really special to them,” said Dr. Jessica Morales-Chicas, co-director of faculty coordinators for the program at Cal State LA. Morales-Chicas told Diverse that it was important to help students think early about pursuing a major in STEM before they even enroll in college. At the end of the two-week Cal State LA summer program, the university hosted a technology expo for participants and their families where students were honored for completing the program. “We presented them with certificates to get them excited about the milestone that they’ve reached and the fact that they already developed applications and it’s only the beginning,” Morales-Chicas said. Other schools currently participating in the program include: Central State University, Clark Atlanta University, Delaware State University, Hampton University, Harris-Stowe State University, Texas Southern University, Morgan State University, Jackson State University, North Carolina A&T, Kentucky State University, University of the District of Columbia, and California State University, San Bernardino. Institutions affiliated with the Verizon Innovative Learning program are currently looking for additional ways to engage minority males in STEM-related activities in the fall and beyond. “Our university partners and the resources they bring to the table are helping these young men realize their potential in becoming the change-makers of tomorrow’s tech-driven economy,” Nixon-Saintil said.